Location: Facing NE on a triangular site at the junction between the main road, along the shore of Bala Lake, and the by-road to Parc; set back behind a rubble walled forecourt. Dated 1838; built as a Church Schoolroom and Schoolmaster's House and capable of taking 50 to 60 children. The 1847 Education Report indicates that the school did not flourish and had closed after only a few years. Small one-and-a-half storeyed former schoolhouse in simple Tudor style; of rubble construction with renewed slate roof and overhanging, boarded eaves. Distinctive hexagonal stone chimney to centre with cornice and square base. Symmetrical 2 window front with gabled porch to centre. This has an inscribed, segmentally-arched, timber panel over the entrance; square headed openings to sides and seats within; boarded double doors. Flanking 3-light metal frame casement windows with diamond-paned metal-frame glazing over high transoms; slate lintels with stopped labels. Similar window to left hand gable end and another to 2 window rear; eaves raised in two places at rear to accommodate modern dormers. Plain 3 light window to right hand gable end where boundary wall steps up; attached monopitch-roofed outhouse. Simple interior with triangular-shaped lobby created by diagonally placed doorways; schoolmaster's house to left and schoolroom to right, with fireplaces to central dividing wall. Listed as an early C19 school of well-preserved picturesque Tudor Gothic character. Set back from the road within its own grounds, opposite the church and church yard. Set within its own walled churchyard on the banks of Bala lake, immediately to the SE of the main road. 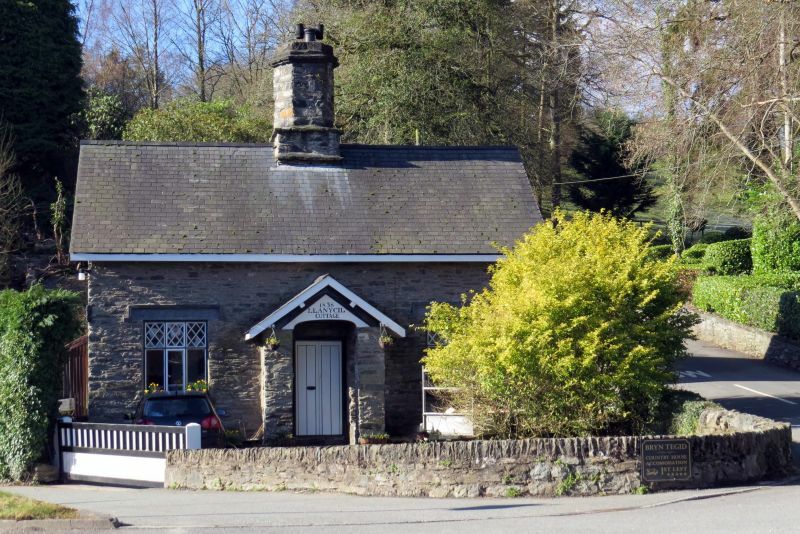 Located on a raised plateau overlooking Bala lake at the SW edge of Llanycil village; at the end of a lane running SW from the Llanycil - Parc road immediately past Llanycil Cottage. Set in its own extensive, landscaped grounds above Bala Lake, approximately 1km from Llanycil; accessed via a long drive running NW from the main road (A 494). In an elevated position above the SE side of the B4403 at the N end of Lake Tegid.